Do you know how to check your car's battery? 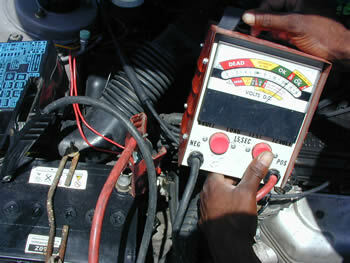 Many drivers often rely on gas station service attendants to check their car's battery for water. Checking the battery for water quite a simple task that you can learn to do on your own. But is there any other maintenance your battery might need? Our research team interviewed the battery specialist at Unique Battery & Electrical Service to find out. 1. How often should you check the water? 2. How do you remove the battery cap to add the water? 3. Does it matter if you use Tap water or Distilled water? 4. How much water should you put in? 5. What happens if you over fill it? 6. What happens if it runs too low? 7. How often should you check the voltage? 8. What should the voltage read? 9. What may be the cause of a low voltage reading? 10. How do you know when the battery needs changing? 11. Generally how often does it need changing? 12. How can I extend the life of the battery? 13. What causes the battery to lose power? 14. Is there anything you should never do with a battery? Once or twice every 3 months with a new battery. Once a week, if the battery is older than 1½ years. Batteries have different types of caps. Some have caps you can unscrew with your fingers, some you need to use a coin to unscrew them and others you can pull off with your hand. See illustrations below. Yes. You should use distilled water since it lacks the high mineral content present in tap water. Barbados' tap water contains high amounts of lime. The lime settles in the battery compartment causing the development of a lime cell within the battery and inhibits the proper operation of the lead acid cell. Some batteries have a low level and full level marking on the battery. 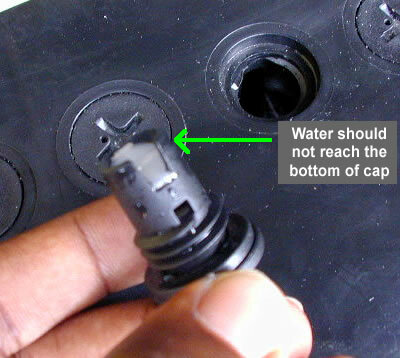 However, some batteries do not have a marking indicating the level you should fill the water to. In such a case you should fill the battery where the water level is below the bottom of the battery cap, when the cap is replaced. 5. What happens if you over fill the battery? If you put too much water is in the battery, when the car is started, the acid will spill. The reaction inside the battery when the car is started causes the water level to rise. 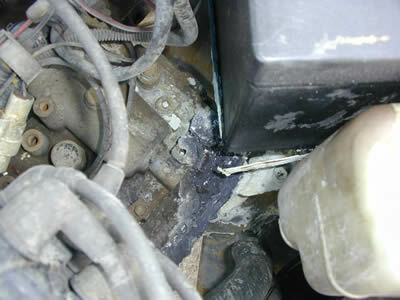 If there is too much water in the battery, the rising water level from the reaction will cause the water to overflow. 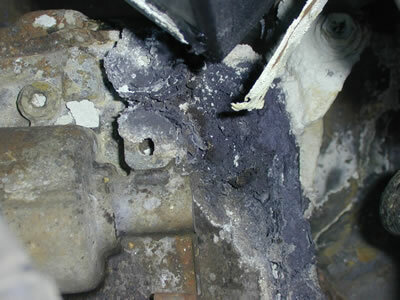 This causes valuable acid inside the battery to be lost. The acid is the conduit in which the electricity flows. The acid will cause corrosion if it comes in contact with metal. 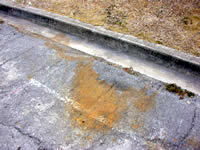 Be careful where you wash off the sediments cause by the corrosion since it will leave a stain. Big brown stains may not look to good in your garage. 6. What happens if the water runs too low? Two serious problems occur by running the water level too low. There is an increase in heat and a deterioration of battery plates. This restricts the battery from charging and destroys the battery plates. Just like overcharging this destruction can take place in a matter of 5 months. 7. When should you check the voltage? You should check the voltage if the battery light indicator in your dashboard remains on after starting the car. The light may also flash while driving. Some batteries have a 3½ year life span. Ask your dealer for the life span of their battery. Make sure the battery is properly serviced. Make sure battery terminal and leads are clean to ensure a good connection. Leads can be cleaned with a steel brush or a terminal post cleaner. Make sure the battery is properly installed i.e. battery straps should keep the battery from rocking. The bumps an unstable battery will receive, especially from driving through potholes, will knock about 6-8 months off the life of the battery. Install the appropriate battery to meet the power requirements of your vehicle. It is better to have reserved capacity than too little. By taking out more than you are putting in. When the car is running, the car's alternator recharges the battery. If you do anything to use the battery's power faster than it is being replaced, you will drain the battery. High powered amplifiers for car stereos are often the culprits of battery drain. When the car is off, the battery is not being recharged. Therefore, running any appliance when the car is off will drain the battery. Leaving on the lights or playing the stereo when the car is off are common causes of battery drain. You should never expose it to flame. The gasses emitted by batteries can be explosive. Never short circuit the battery. It may explode. Prevent water inside battery from coming in contact with skin or eyes, as it is acidic. Never lean over the battery while it is charging or being jump-started. Do not lift the battery by it sides. Applying pressure to the sides may cause the battery acid to spill, especially batteries with plastic cases. Use a battery carrier or lift it with your hands at opposite corners.